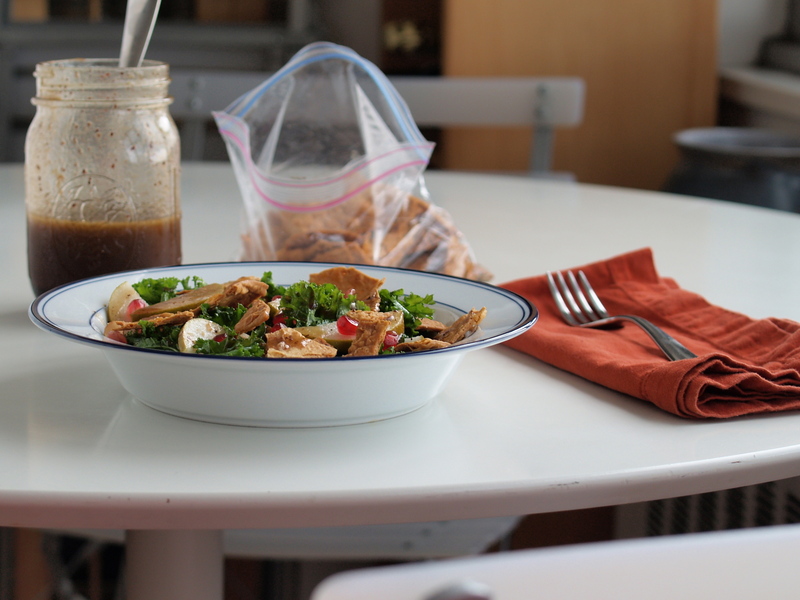 Like a dog with a bone, this fattoush is a salad that I just can’t drop. It started with all that flatbread that a guest gave me one evening. Squirreled away between layers of parchment, wrapped in a big plastic bag, and secured with several rubber bands, it taunted me from my freezer. Armed with Einat Admony’s green fattoush recipe and a sumac dressing, I devised a plan to free up valuable ice cream space: every week, I pull out a floppy lavash square, douse with olive oil, sprinkle with salt and sumac, and brown to a crisp. I smash those now-brittle squares with the palm of my hand and the satisfying crackle of bread shattering onto the baking sheet. A nice pile of crackly crushed flatbread shards is what makes fattoush fattoush, the salad’s name derived from Arabic fatta – to crush. And so began my addiction. The first fattoush I made was fairly traditional and felt like a romp through the garden, or as close to a garden romp as you can get in the middle of the city — the Union Square greenmarket for vegetables and greens and even some weeds. Now, eating weeds is a new thing for me, but when I couldn’t find the watercress called for in Einat’s recipe, I grabbed purslane because it looked similar. Sort of. Before you think I’ve gone all urban forager on you, no, I didn’t yank up leaves sprouting from sidewalk cracks. Instead I picked up a large bundle, roots still attached, at the greenmarket near work and dropped it right into my canvas tote. At home, I washed the purslane thoroughly – soak, swish, drain, repeat, repeat, repeat – and released the leaves by holding each stem from the top and running my fingers down to the bottom, knocking each delicate bundle off in quick succession. 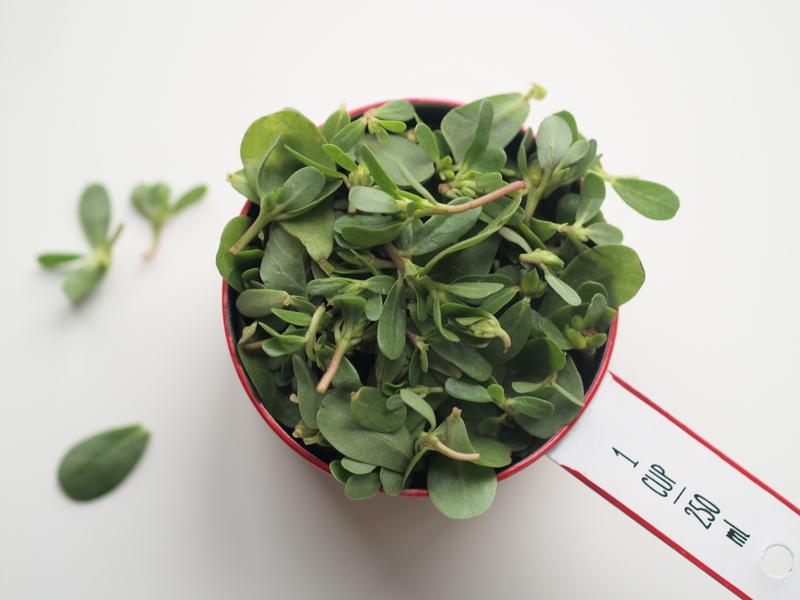 Purslane is a succulent and tastes similar to baby spinach, but its leaves are a little thicker and spongier, its bite a bit sour. I found that after three or four days, purslane can get a little slimy, as if you were biting into a very young jade plant (not that I’ve done that, but you get what I mean, right? ), so use it up quickly. 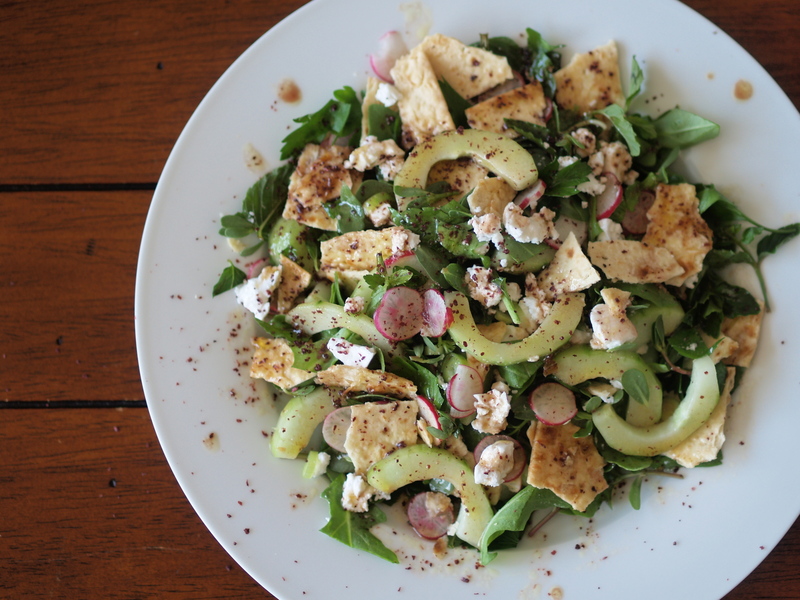 To the weeds and greens, for that first fattoush, I added large handfuls of herbs, peeled cucumbers, and thinly shaved radishes, all straight from the market. To give the fattoush a bit more heft, I added feta. The next time I made it, I added grilled chicken breast. As the summer’s slipped away and the weather’s turned downright blustery, my salad has evolved. I’ve noticed that as the temperatures outside have dipped, I’ve been toasting the flatbread in the oven a little longer, relishing the extra heat in the kitchen, relishing the even crispier crisps. I’ve swapped out delicate greens for hardier ones, skipped the herbs, and added some of my favorite orchard fruits. This weekend, while the oil-slicked, sumac-sprinkled lavash was browning, I massaged a pile of kale into wilted submission, sliced an Asian pear, and mellowed half a red onion with a brief soak in white vinegar. I whacked the seeds out of a pomegranate and shook together some dressing. I nearly burned my hand as I pressed down on the straight-from-the-oven sheet of lavash, crushing it to shards. 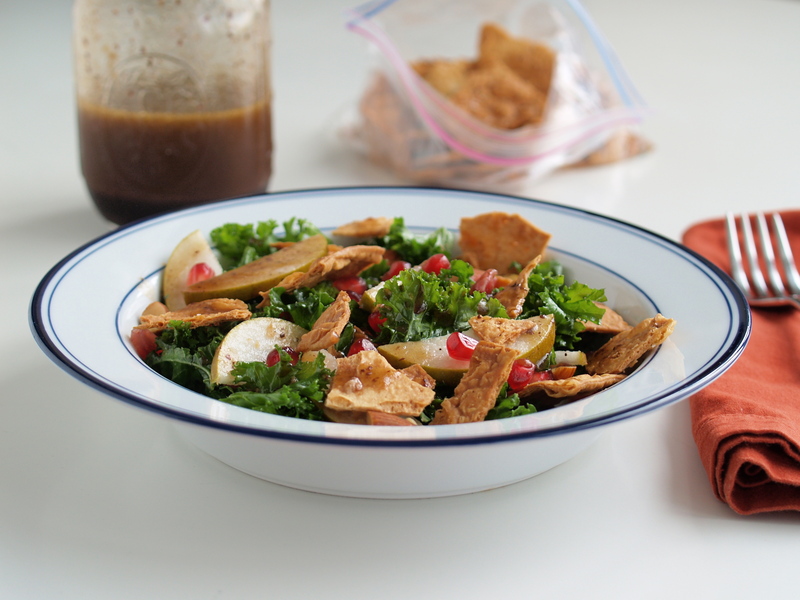 This fall fattoush is not nearly as dramatic as I’m making it sound, but it does have more of an in-your-face quality than the summer version. Here’s a closer look. After two seasons of fattoush under my belt, I’m down to my last three lavash squares. I’m hoping they’ll last me through Thanksgiving. Fattoush is the Middle East’s answer to panzanella, with croutons made of crispy toasted lavash. The inspiration for this salad came from Einat Admony’s version published in the Wall Street Journal. I based the salad dressing on the one in this fattoush recipe in Bon Appétit. My favorite feta is a Bulgarian sheep’s milk one from Pastures of Eden– it’s delicate and less salty than Greek feta; you can find it at Trader Joe’s. Or skip the feta and slice up a grilled chicken breast or two. Make sure not to dress the salad until right before serving. Toss: Mix together the greens, herbs, radishes, cucumbers, and spring onions and toss with 1/2 cup of dressing. Taste and add more dressing if necessary. Top. 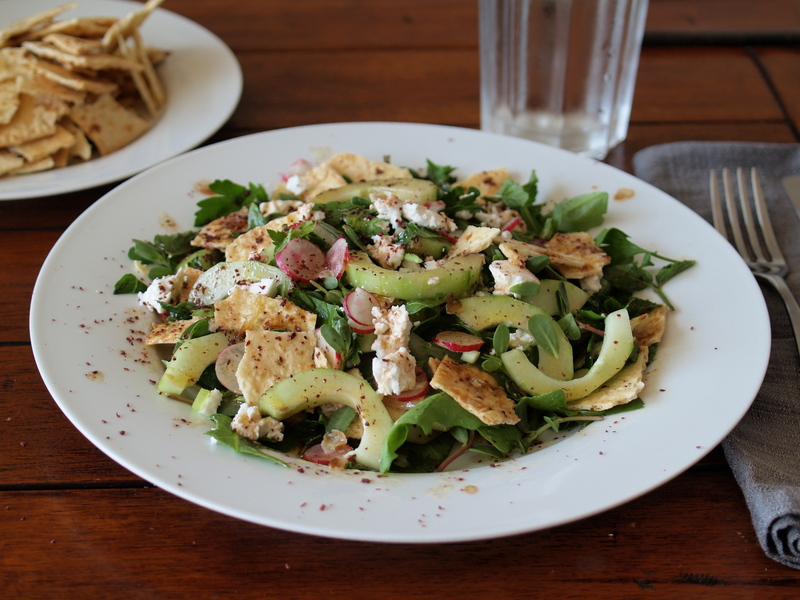 Crumble the feta over the salad and sprinkle with lavash crisps. Massage. With your hands, massage the kale with olive oil and let sit for at least 15 minutes until the kale starts to soften. Soak. In a small bowl, mix the red onion, vinegar, water, and salt and let soak for at least 15 minutes until the liquid turns light pink and the onions are pickled enough that you can eat them straight from the bowl. Whack. Cut the pomegranate in half lengthwise. Hold one half in your palm, skin side up. With a wooden spoon, whack the skin over a large bowl until all of the seeds fall out. You will make a mess. Pour water into the bowl over the seeds – any membranes will float to the top and you can easily skim them off. Chop. Roughly chop the almonds. Toss. Mix together the kale, drained red onion, pomegranate seeds, and apples or pears with 1/2 cup of dressing. Taste and add more dressing if necessary – because of the kale, you might need up to 2/3 cup of dressing . Top. Crumble the feta over the salad and sprinkle with chopped almonds and lavash crisps. Adapted from this fattoush recipe in Bon Appétit. This dressing is delightfully puckery and helps tie whatever vegetables you use with the sumac-dotted lavash crisps. You might be tempted to use it as a marinade for chicken and I wouldn’t blame you. Shake. Pour all ingredients into a jar and shake. The trick here is to toast pieces that are crispy enough to stand up to the dressing without getting soggy. Some recipes have your fry the lavash, but I prefer to generously (generously) brush it with oil and and them bake until quite brown. I’ve found myself eating these out of hand, so you might want to make more than you’ll need for your fattoush. Brush. If using pita, split each into two thin rounds. Brush olive oil on both sides of the bread – this is not the time to be stingy with your oil. Sprinkle one side with sumac and salt. Bake. Lay the bread out on a baking sheet. Bake at 350 for 10-12 minutes, or until the bread browns. Pita might take slightly longer because it is thicker. Break. After it cools, press down on the brittle bread to crush it into bite-sized pieces. Store. The crisps will keep for several weeks in an airtight container. If they start to go stale, just pop them in the oven for a few minutes to crisp them back up. Best salad ever! I always make the crisps with pita bread slightly toasted in the oven with zaatar and olive oil.